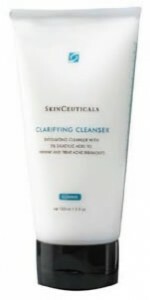 Specifically formulated for acne-prone skin, SkinCeuticals Clarifying Cleanser combines salicylic acid, an FDA-approved acne treatment, with the exfoliating powers of glycolic and mandelic acids to unclog pores and help improve the appearance of problematic skin. Clarifying Cleanser also includes smoothly rounded microbeads to gently slough off dead skin cells and cellular debris. Used in conjunction with SkinCeuticals Blemish Control Gel, this gentle cleanser treats existing whiteheads, blackheads, and other acne-related blemishes, while helping to prevent future acne breakouts.